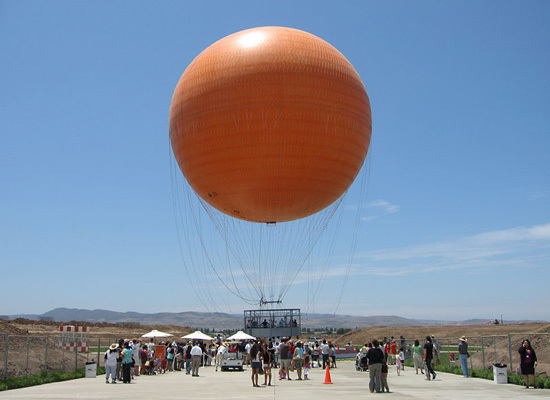 Instead of a wind farm that no one seems to want built near their homes, how about a hot-air balloon farm to generate renewable energy? For us, we want to see some fantastic, unrepentantly beguiling images showing vast tracts of land (or the ocean) planted with boldly colored balloons bobbing up and down, a strange buoyant forest unfurling and retreating during the day, fully resting at night. Taking cues from Ken Smith and Kathryn Gustafson, urban parks everywhere will have their own aerial installations, generating power for the park itself, if not for the surrounding neighborhood. Or in the urban periphery of foreclosed suburbs, now bulldozed and eradicated, reformatted as energy fields, electrifying cities and hopefully not tragically impeding bird migrations. nobody wants a wind farm? [i should look at the link & i will, but this comment struck me particularly hard as i remember making it my business to drive by the localish wind farm when i went i was bi-city & traveled bi-weekly to or from LA to SF/SF to LA. "vast tracts of land (or the ocean) planted with boldly colored balloons bobbing up and down..."
I get what you mean but putting ballons and windmills and solar panels over vast tracts of land doesn't sound particulary environmentally friendly, despite the clean energy. We have to evaluate these things with a more comprehensive environmental approach than clean energy production.